Services - Anderson's Electronics Inc.
Our testing procedures meet or exceed IEEE standards and the battery manufactures recommendations. It is imperative to not only prove that the battery can support the existing load for the required time, but to also determine when the battery should be replaced to maintain system reliability. We have developed a two stage testing procedure that proves the exact capacity of each cell or battery. The first step is a visual inspection of the battery including interconnect hardware, case distortion, post seal leaks, jar to cover leaks and temperature readings of the battery bank. 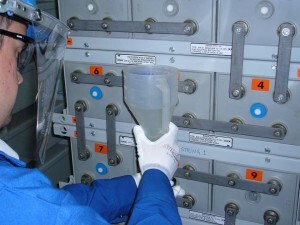 This also includes the condition of the battery rack / cabinet and the ventilation and temperature of the battery room. The float voltage for the entire bank is measured and should be within range for the battery technology / temperature. Any service affecting issues are documented and recommendations are submitted. 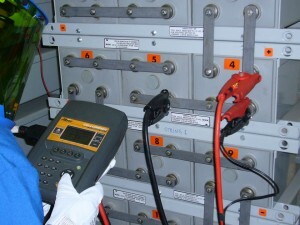 Internal Resistance Testing; is a non-intrusive test that is done online with the battery connected. We test and record the Voltage, Interconnect Resistance and Internal Resistance for each cell / battery in the bank. The voltage readings should be fairly uniform and correct for the operating temperature of the battery. The interconnect resistance readings should be as low as possible and be uniform for each connector type. If any of the interconnect hardware connections are found to be out of tolerance then a clean up or replacement of the interconnect hardware will be recommended. The internal resistance readings should be as low as possible and be uniform for each battery technology and model type. If any of the internal resistance readings are found to be out of tolerance then a capacity test or replacement of the battery will be recommended. Capacity Testing; is a scheduled test, where we connect our portable load banks to your isolated battery and draw a constant amount of current for a specified amount of time. The battery manufactures publish the amount of current that can be drawn for a given amount of time to a specific end voltage and temperature. We take (10) Ten Voltage Readings per cell or battery to provide you with the exact battery capacity. We then compare the capacity test results to others in our server which enables us to provide a projected end of service life. The helps with budgeting, asset management and maintaning electrical reliability. Our Testing Report Is the Difference! Here’s WHY…..
High quality test equipment that is maintained and calibrated regularly. 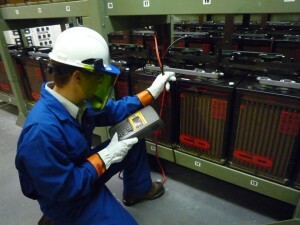 Our field technicians receive extensive training on test lead placement to obtain accurate readings each and every time. 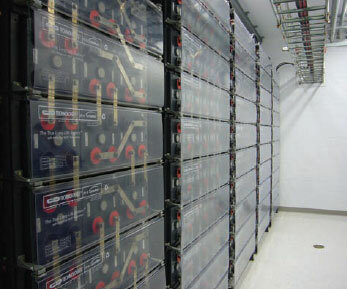 All the conditions that influence the batteries capacity and service life are recorded and trended. We compare your battery test results (same manufacturer/vintage) with our existing custom designed database, which now contains more than 360,000 test data points. Most importantly our in depth reports are conclusive, easy to read and share with others. Our reports (hard or soft copy) define actions necessary to maintain DC System reliability. They are also utilized for budgetary purposes. Exclusive to Anderson’s Electronics in Canada we have developed a Catalyst Re-hydration Procedure, which improves “Ohmic” readings and most importantly restores lost capacity. Our procedure has been proven to extend the service life of most VRLA cells, by at least three years. Please call us to see if your cells would qualify for our service.